Al Cushall did an outstanding job of researching and presenting material for this Taste To Learn. The following notes explain the specifics of Sherry vs Port and Maderia. There were 13 attendees and a great deal was learned by all. Thanks Al! A BIG Thanks to Pamela for opening her home for the event and preparing an outstanding pork roast. Manzanilla: an especially light variety of Fino Sherry made around the port of Sanlúcar de Barrameda. Amontillado: a variety of Sherry that is first aged under flor but which is then exposed to oxygen, producing a sherry that is darker than a Fino but lighter than an Oloroso. Naturally dry, they are sometimes sold lightly to medium sweetened but these can no longer be labelled as Amontillado. Amontillado and Medium Sweet Sherries in a sealed bottle will last for 18 to 36 months. If the bottle is open they will last 2 -3 weeks. * Amontillado is an ideal wine to accompany soups and consommés, white meats, blue fish and strong cheeses. Oloroso (‘scented’ in Spanish): a variety of Sherry aged oxidatively for a longer time than a Fino or Amontillado, producing a darker and richer wine. With alcohol levels between 18 and 20%, Olorosos are the most alcoholic Sherries. Like Amontillado, naturally dry, they are often also sold in sweetened versions called Cream Sherry. As with Amontillado “Sweet Oloroso”, “Rich Oloroso” and “Oloroso Dulce” are prohibited terms. Oloroso in a sealed bottle will last for 24 to 36 months. If the bottle is open they will last 4 -6 weeks. * Oloroso is the best Sherry Wine to serve with game and red meats. Palo Cortado: a variety of Sherry that is initially aged like an Amontillado, typically for three or four years, but which subsequently develops a character closer to an Oloroso. This either happens by accident when the flor dies, or commonly the flor is killed by fortification or filtration. Jerez Dulce (Sweet Sherries): made either by fermenting dried Pedro Ximénez (PX) or Moscatel grapes, which produces an intensely sweet dark brown or black wine, or by blending sweeter wines or grape must with a drier variety. Pedro Ximenez in a sealed bottle will last for 24 to 48 months. If the bottle is open it will last 1 -2 months*. Pedro Ximenez and Moscatel are ideal wine to serve with all types of pastries, blue cheese and chocolates. Cream: the term for sweetened Oloroso and is rich deep amber to golden brown & very sweet and is a common type of sweet Sherry made by blending different wines, such as Oloroso sweetened with PX. Cream Sherries in a sealed bottle will last for 24 to 36 months. * Pale Cream, served chilled, is an excellent wine to accompany foie gras and fresh fruit. Cream is the most appropriate Sherry Wine to accompany sweet pastries. Medium Sherry, served slightly chilled, is the perfect wine to accompany pates and quiches. White Port: Made from white grapes, this gold-colored wine can be off-dry or sweet. Served with tonic and ice, white Port can be a bracing warm-weather apéritif. Ruby Port: This young, non-vintage style is aged in wood for about three years before release. Fruity, simple, and inexpensive, it’s the best-selling type of Port. If labeled Reserve or Special Reserve, the wine has usually aged about six years and costs a few dollars more. Vintage Character Port: Vintage Character Port (or Reserve) is actually premium ruby blended from higher-quality wines of several vintages and matured in wood for about five years. Full-bodied, rich, and ready-to-drink when released, these wines are a good value. 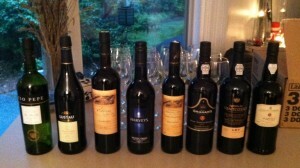 Tawny Port: Tawny is the most versatile Port style. The best tawnies are good-quality wines that fade to a pale garnet or brownish red color during long wood aging. Tawny Ports are appropriate both as apéritifs and after dinner. Colheita Port: Often confused with Vintage Port because it’s vintage-dated, colheita is actually a tawny from a single vintage. In other words, it has aged (and softened and tawnied) in wood for many years. Unlike an aged tawny, though, it’s the wine of a single year. Crusted Port: Blends of at least two or more vintage years that age in wood for up to four years and ideally at least three years in the bottle, left unfiltered and are intended to be aged in bottle for midterm cellaring (10-20 years). Late Bottled Vintage Port (LBV): This type is from a specific vintage, but usually not from a very top year. The wine ages four to six years in wood before bottling and is then ready to drink, unlike Vintage Port. Quite full-bodied, but not as hefty as Vintage Port. Vintage Port: The pinnacle of Port production, Vintage Port is the wine of a single year blended from several of a house’s best vineyards. It’s bottled at about two years of age, before the wine has much chance to shed its tough tannins. It therefore requires an enormous amount of bottle aging to accomplish the development that didn’t occur in wood. Vintage Port is usually not mature (ready to drink) until about 20 years after the vintage. By law must be bottled between July 1st of the second year and June 30th of the third year. Sercial: Nearly fermented completely dry, with very little residual sugar (0.5 to 1.5° on the Baumé scale). This style of wine is characterised with high-toned colours, almond flavours, and high acidity. Verdelho: Its fermentation is halted a little earlier than Sercial, when its sugars are between 1.5 and 2.5° Baumé. This style of wine is characterized by smokey notes and high acidity. Bual (also called Boal): Its fermentation is halted when its sugars are between 2.5 to 3.5° Baumé. This style of wine is characterized by its dark colour, medium-rich texture, and raisin flavours. Malvasia (also known as Malmsey or Malvazia): Its fermentation halted when its sugars are between 3.5 and 6.5° Baumé. This style of wine is characterised by its dark colour, rich texture, and coffee–caramel flavours. Like other Madeiras made from the noble grape varieties, the Malvasia grape used in Malmsey production has naturally high levels of acidity in the wine, which balances with the high sugar levels so the wines do not taste cloyingly sweet.